The SFB 948 welcomes Prof. Dr. Tolga U. Esmer (Central European University, Budapest) as its next visiting researcher. His research focuses on the history of the late Ottoman Empire, especially the social and political significance of so-called social bandits. He will be at the SFB 948 from August until November 2015, working on his project "Bandits, Saints, and Ethno-Martyrs: Remembering a Muslim Frontier Family in the 'Age of Nationalism' in the Balkans". The SFB 948 would like to welcome another guest researcher: Benjamin van Tourhout from KU Leuven. Van Tourhout is active as a playwright, author and director, who also reflects on his artistic work in scholarly projects. Along these lines, he will be working on his project "How to Touch the Untouchables? How Can a Historical Hero Shed an Ethical Light on Contemporary Paradigms Through Theatrical Narrative?" during his time at the SFB 948. Van Tourhout is also the head researcher on the project "Recreating the Hero: Research Towards a Contemporary and Present Artistic Interpretation of Archetype Heroes" at the LUCA School of Arts. On June 8, 2015, Matinee, the Sunday feature of the German radio station SWR2, aired an episode entitled "Raus aus der Krise – Die Rückkehr der Helden" (translation: out of crisis – the return of heroes). In this three-hour show, we hear from experts on various topics such as heroes in the nursery, heldentenors, everyday heroes as well as cinematic heroes. One of the interviews is with Prof. Dr. Ralf von den Hoff, speaker of the SFB 948, who discusses "Wer sind die Helden von heute?" (translation: who are today's heroes?) The programme is in German. The SFB 948 welcomes its newest guest researcher, Prof. Dr. Holger Hoock (Pittsburgh), whose work focuses primarily on the long 18th century with an emphasis on Great Britain, the British Empire and North America. Mr. Hoock will be a guest at the SFB 948 from May until the end of July 2015, where he will be working on his project "Civil War in the British Empire: Practices, Representations, and Legacies of Violence in the American Revolution and Revolutionary War". 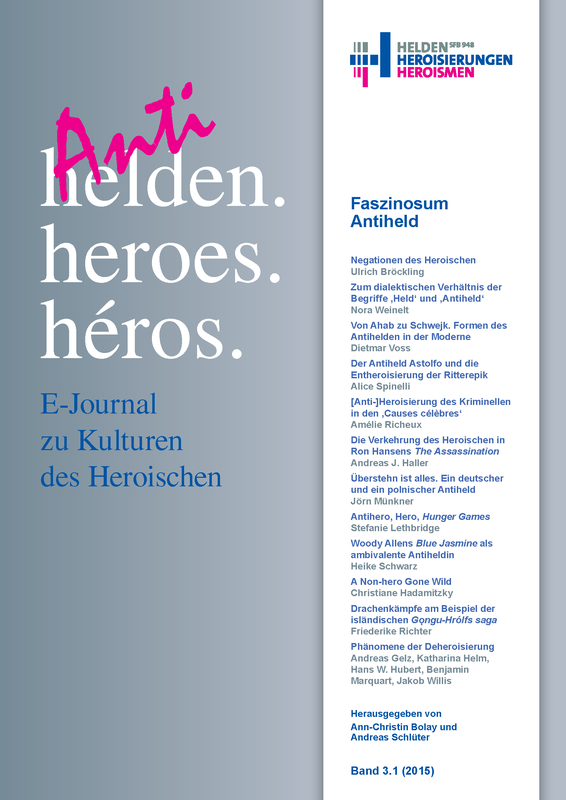 New E-Journal Issue: "Faszinosum Antiheld"
Faszinosum Antiheld, Issue 3.1 (2015) of the SFB 948 e-journal helden. heroes. héros., has been published. On April 10, 2015, the German radio station WDR 5 aired a 20-minute feature on the topic of heroes as part of its series "Neugier genügt". Prof. Dr. Ulrich Bröckling, leader of Project B7, and Prof. Dr. Ralf von den Hoff, speaker of the SFB 948 and leader of Project B1, were interviewed about why Edward Snowden, Batman, and the firefighters from September 11th are labeled as hero(in)es by entirely different groups. The interview is in German. Prof. Dr. Jörn Leonhard, leader of projects A1 and B5, received the 2014 NDR Kultur Sachbuchpreis (non-fiction prize) for his book Die Büchse der Pandora: Geschichte des Ersten Weltkriegs. Prof. Dr. Andreas Bihrer (Kiel University), former leader of Project A3, has had his proposal approved by the DFG Research Grant program for the project "Heilige Heroen – Heroische Heilige: Interdependenzen, Verflechtungen und Transformationen von Leitbilddiskursen im skandinavischen Früh- und Hochmittelalter". His research activity will be conducted in close collaboration with the SFB 948, especially Project A3.